Integration with Xdebug Profiler is one of the most voted feature in the PhpStorm issue tracker, so we are happy to announce that its initial support is already implemented in PhpStorm 3.0 EAP! To be more specific – PhpStorm provides visual representation of profiling data generated by Xdebug. 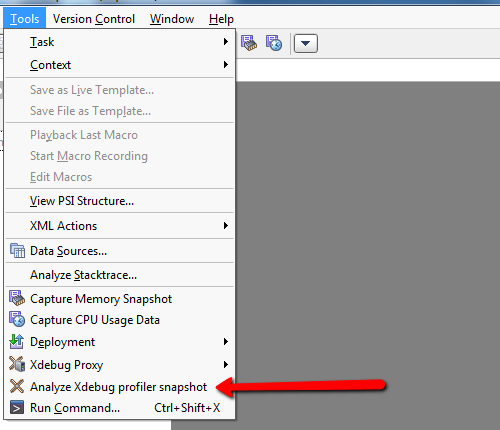 In order to open a profiler snapshot, invoke the ‘Analyze Xdebug profiler snapshot’ action and select the path to the snapshot. Note that you can select several snapshots at a time and collect the aggregated profiling information. ‘Execution Statistics’ – displays summary information about execution metrics of every called function. ‘Call Tree’ – displays the execution paths of the called functions. ‘Callees’ – same as ‘Call Tree’ but with the selected function as the root. ‘Callers’ – all the paths that can result in calling the selected function. To learn how to configure the Xdebug extension so profiling is enabled follow official documentation at http://xdebug.org/docs/profiler#starting. You can use our Xdebug bookmarklets generator to toggle profiling directly from browser toolbar. Developing integration with the profiler is still in progress, so we are looking forward for your feedback! This entry was posted in Cool Feature, PhpStorm and tagged PhpStorm, profiler, Xdebug. Bookmark the permalink. ; Xdebug will try to connect to the debug client as soon as the script starts. ; Xdebug will only try to connect to the debug client as soon as an error condition occurs. ‘xdebug.trace_output_dir’ sets output directory for function traces (see http://xdebug.org/docs/execution_trace#trace_output_dir). 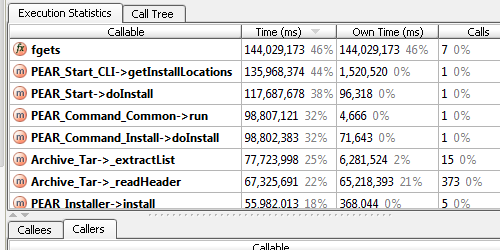 The same option for profiler is ‘profiler_output_dir’ (see http://xdebug.org/docs/profiler#profiler_output_dir). In general, your configuration looks fine. The only suspicious line as for me is ‘xdebug.profiler_output_name = “xdebug_profile.%R::%u”‘. It specifies the file name that contains the colon symbol. From your listing I assume that you’re running Windows, so the file system is probably NTFS or FAT. Both of them disallow to use ‘:’ for a file name. Any chance of lovely graphical profile time/call maps like kcachegrind does? is there a way to set the profiler_output_dir to output per domain? right now on my dev machine i have many projects. I would like to set the profiler output for the site to appear within the currently setup FTP area so i can download it from within PhpStorm via the “Remote Host” panel. If I set the profiler_output_dir to a fixed location on the remote dev machine I have to go outside PhpStorm to transfer the profiler output back to my local machine to then run the profiler. Hoping to avoid leaving PhpStorm.